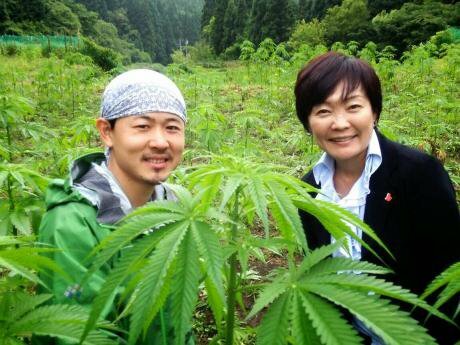 Akie Abe, Japan’s first lady, visits a legal hemp farm in western Japan, 2015. Image: Akie Abe, Facebook. Japan today has some of the harshest drug laws of any advanced democracy. If you are found in possession of cannabis in Japan for personal use you could receive a maximum prison sentence of five years, and if you are caught growing it, you can be sent to prison for up to seven years. Each year, the laws are enforced against 2000 people, who are brutally publicly shamed before, during and after their prison sentence. For example, when the actress Saya Takagi was caught with cannabis, all reruns of the dramas she appeared on – like the popular detective series Aibo – were scrubbed from the TV schedules. She had written the theme song for another TV show: it was immediately ditched. Or to give another example, when a rugby player for Japan’s national team was caught with the drug, he was banned from ever playing again, and the electronics giant Toshiba suspended all sponsorship of his regional team. To be associated with cannabis in Japan is to be destroyed. Hemp – which is made from the cannabis plant – was central to Japanese life. It was used to make clothes and ropes, and was at the heart of to sacred ceremonies. Jon Mitchell explains further: “Cannabis was revered for its cleansing abilities, so Shinto priests used to wave bundles of leaves to exorcise evil spirits. Likewise, to signify their purity, brides wore veils made from cannabis on their wedding days. Today, the nation’s most sacred shrine – Ise Jingu in Mie Prefecture – continues to have five annual ceremonies called taima dedicated to the nation’s sun goddess. However, many modern visitors fail to connect the names of these rituals with the drug so demonised by their politicians and police.” Kids used to be told that only the best children grew up to resemble cannabis plants, because they were tall and strong.